Ah, just kidding. I photoshopped that little black dot in. But if I had been able to get a picture of the transit, it would have looked something like that. Probably. Actually, I’m not sure why I didn’t see anything. I didn’t have any special filters, so I had to wait until sunset to get a picture. Still, Venus should have been near the edge of the disk but not gone by then, and it’s big enough that it should have shown up even with my little camera. But no. There was nothing there. I’m not sure why. But it was a very clear day, so maybe the sun was still too bright for my camera’s sensors and Venus just got washed out. 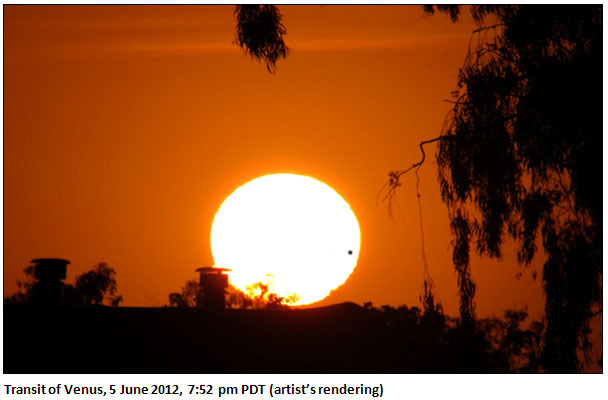 Nonetheless, according to the LA Times, if I’d been able to see anything, Venus would have been about where I put it.